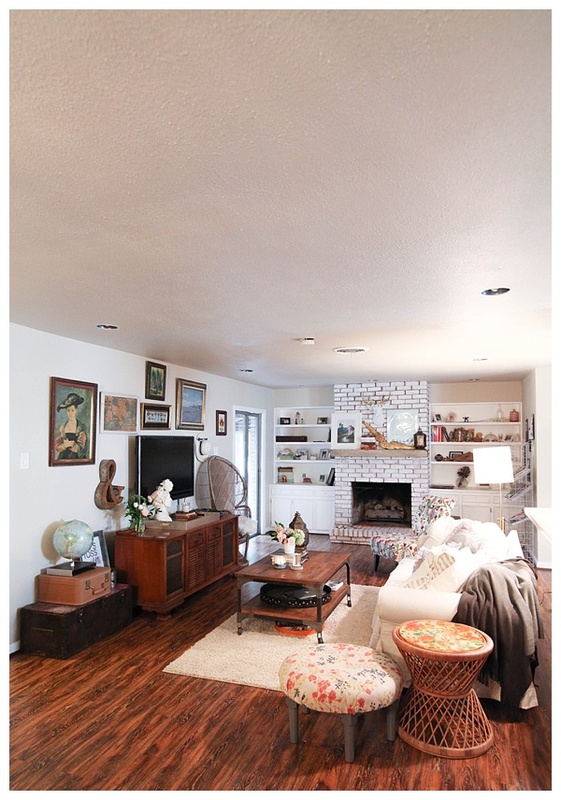 Updated House Tour with Before and After Photos! 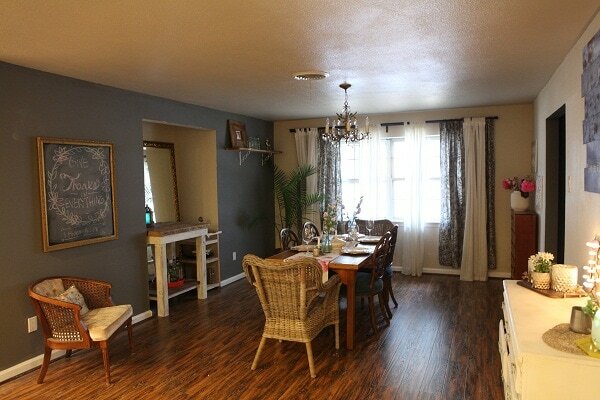 Let’s start out with the dining room! This is actually the only “cheat” photos in this post…the after photo is NOT how you would see it if you came over today BUT there’s a super-secret cool project in there that I can’t share just yet. 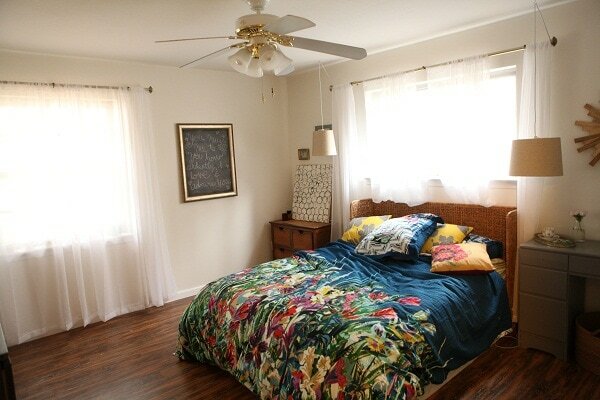 But it’s still a fun room to look at!! 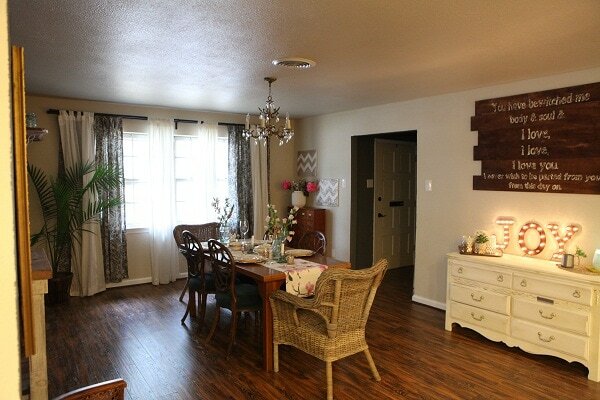 As you can see, our dining room actually used to be a formal living room, but since we are the kind of couple that likes to entertain and share meals around the table with our friends way more than sit on a sofa, we decided to switch the floor plan up a bit. 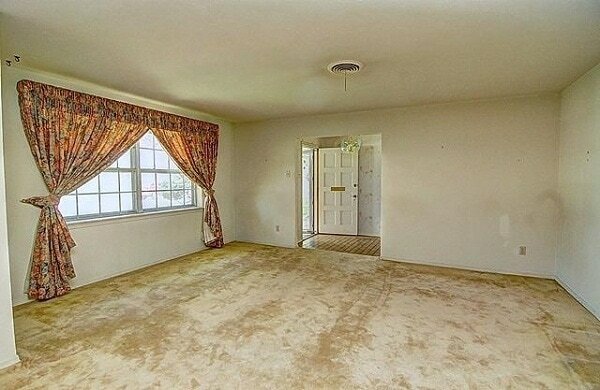 We removed the heavy curtains and old carpet. We also added a wall which you can see in the after photo—more on that later. In this room you’ll find the only two things we’ve kept from the original house so far—the chandelier and the large gold mirror. Those are two of my favorite pieces! 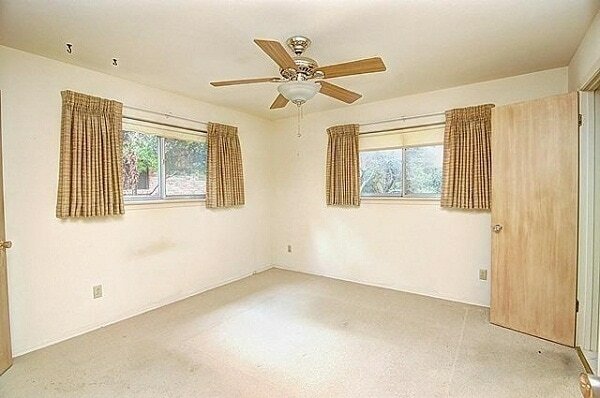 Here is how our living room looked when we moved in. Yikes. 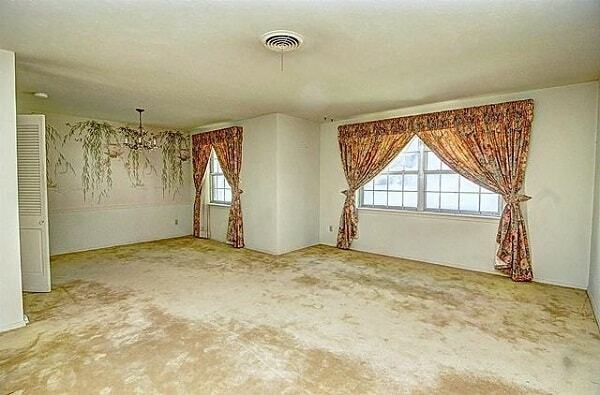 I’m not sure what I hated more—the dark wood paneling, the carpet or all the random, off-centered light fixtures. They all had to go! The fireplace was one of my favorite projects to date. 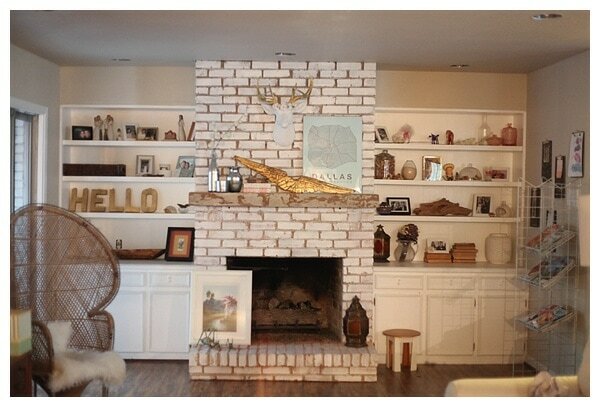 We ripped off the brass and the mantle, and white-washed the fireplace. After removing the doors from the top half of the bookcases, reinforcing the shelves and painting them a bright white, we were able to find the perfect fireplace mantle to add back on. 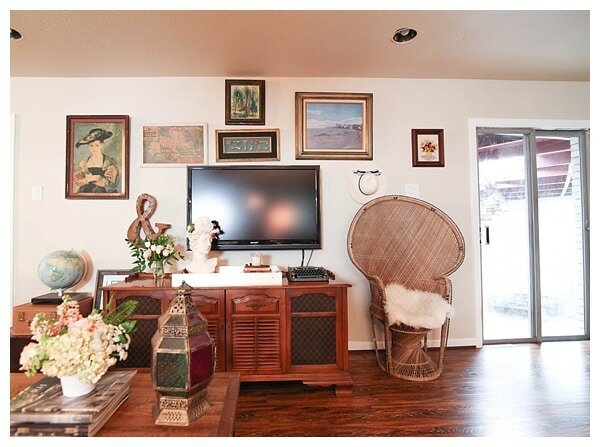 I also created a gallery wall around the television since it was one of the few blank walls we had space for art. I often say if I went back to college for another degree it would be for art appreciation, so I use art liberally throughout our home. Ya’ll. Come on into the kitchen. Bless our hearts, right? 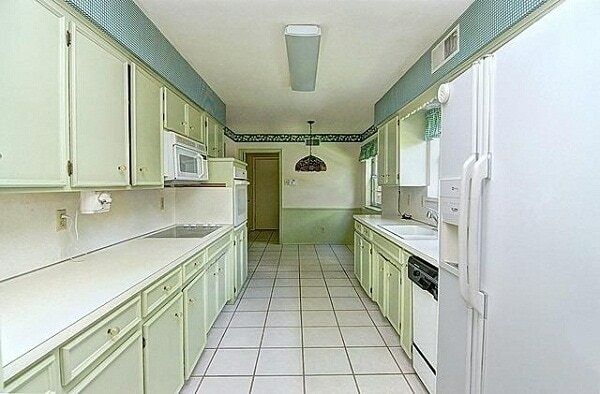 It was really, really, green when we moved in, and long and narrow. 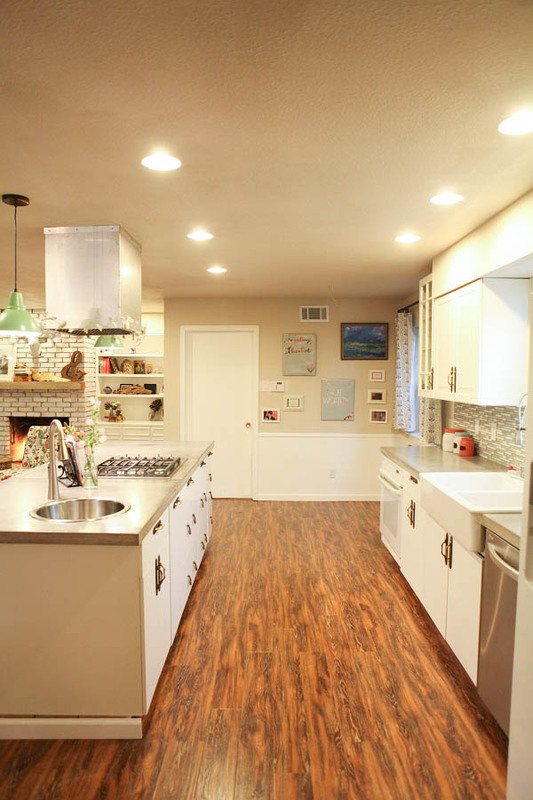 But we took care of that by completely removing the wall separating the kitchen from the living room to create an open floor plan, adding new lighting and using white cabinets. Isn’t the hardware gorgeous? We found all the cabinet pulls at a salvage store in Dallas—I like to imagine they have a glamorous history at one of Dallas’ many lovely hotels. Let me tell you about another favorite project. See our countertops? They are made of solid concrete. 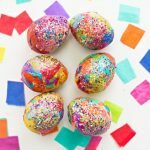 I am so proud of all the work we put into creating them! It was a long process, but worth every minute. I absolutely love them. And now for the wall I mentioned earlier from the dining room. 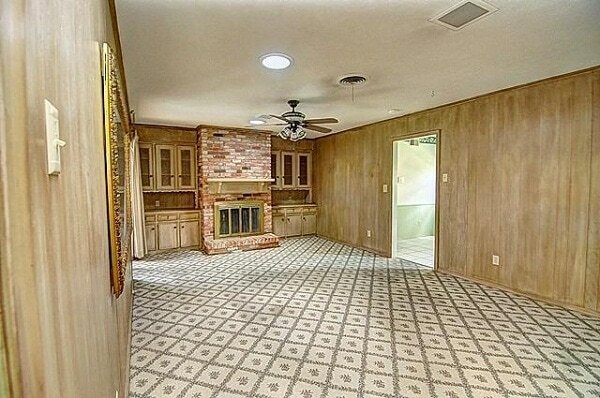 We added this wall because while we both love to cook, we both like having a clean kitchen—especially with such an open floor plan. 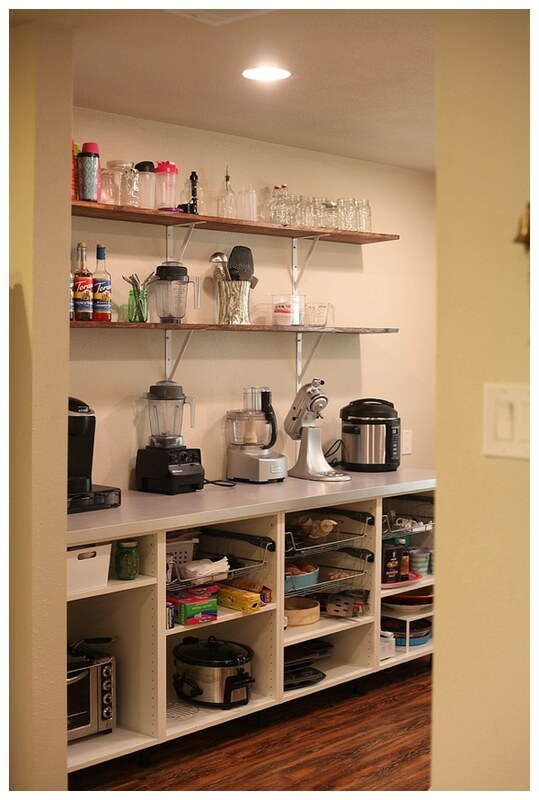 When we were planning our house, I wanted an extra large pantry with countertops so we could leave all our appliances in there along with extra storage. At the time I didn’t know what it was called, but it’s a butler’s pantry and apparently they are becoming popular yet again. This is still a room in progress, but here’s a peek! Now let’s move into our room. 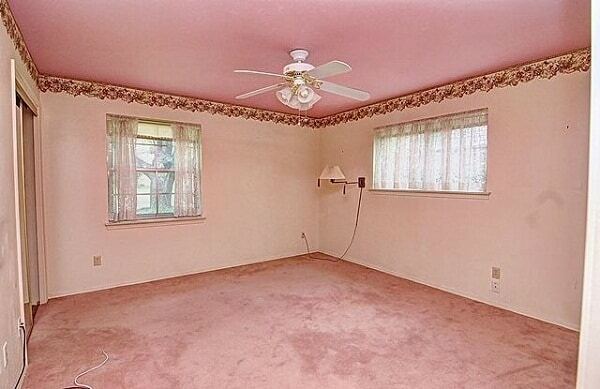 This room was filled with dusty rose literally from ceiling to floor as you can see. Look how much difference a nice coat (or four) of white paint will do. Ahhh. Here’s my favorite room in the house. Ready? This used to be a sad looking spare bedroom, but is now a place filled with my favorite things—books and craft supplies! 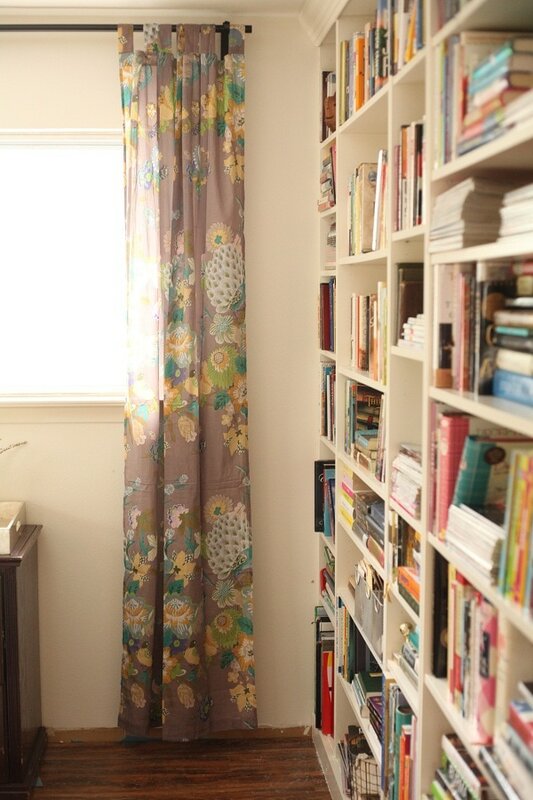 I spend so much time in this room browsing my books, practicing calligraphy, watercolor painting and getting crafty. It’s a popular hangout space for my friends as well, and we’ve had some great times in this room together! My husband built that wall of bookshelves for me using Ikea bookcases, believe it or not. Don’t they look awesome? And aren’t books just lovely? 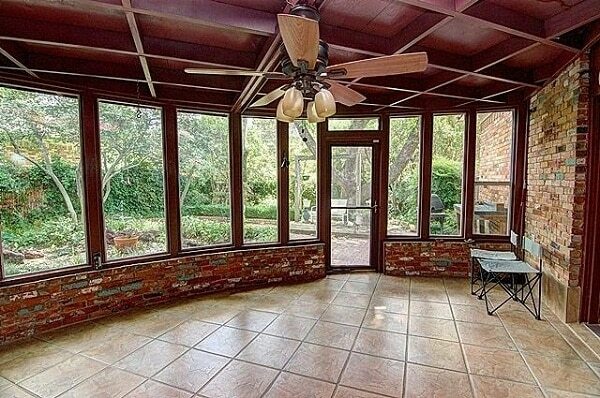 What makes the sunroom so great is the view. In fact, this backyard is what sold us on this house! Our goal was to simply maintain the beauty of the backyard and not kill anything (so far we are doing okay!). 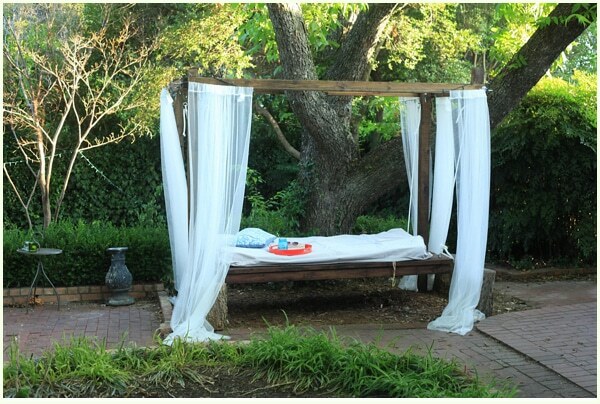 We did add this amazing swinging outdoor bed—it’s a bit too hot to enjoy during the day in the summer, but I am looking forward to the cooler temperatures of fall so I can head back outside with a stack of books to enjoy. 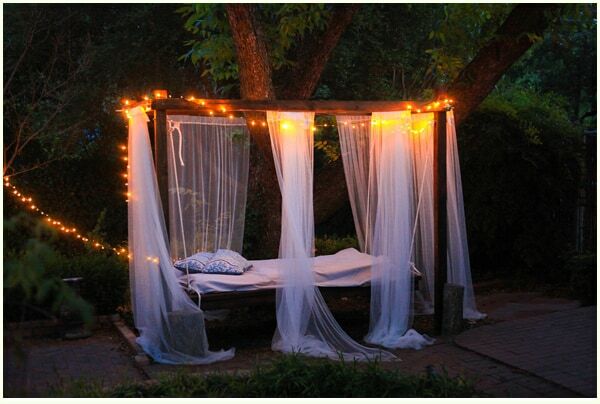 For now though, I settle for laying outside in the warm Texas nights. Whoa! So pretty!!! totally stealing some ideas from you! Love, love, love your beautiful home!!! 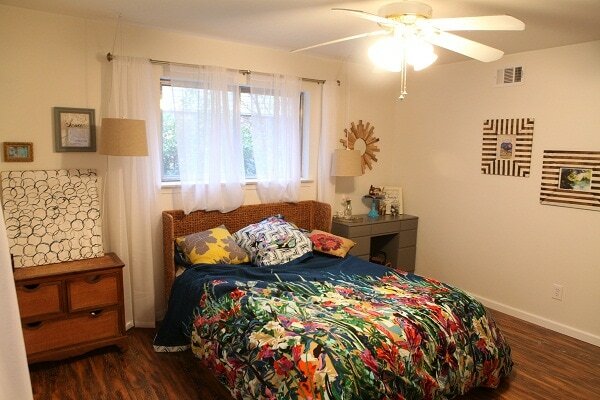 Thank you for sharing your amazing house renovation experience. 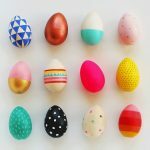 It is absolutely inspiring and makes me feel like I could attempt some of these. You guys are truly awesome! Wow. Just amazing! You need your own tv show – seriously, this is INCREDIBLE!!! 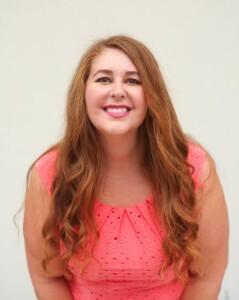 First of all – that photo of you is gorgeous! Secondly….I just love your house! 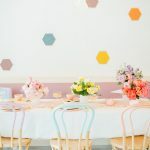 You and your hubs have done such an amazing job transforming each space. It’s so homey and cozy! GORGEOUS! I am just amazed by all of this! i’ve said it before and i’ll say it again: you need your own show on HGTV. seriously! Amaze. When would you like to do my new place? 🙂 Joking, but in all seriousness, your kitchen! Love it. Damn girl! I love it! 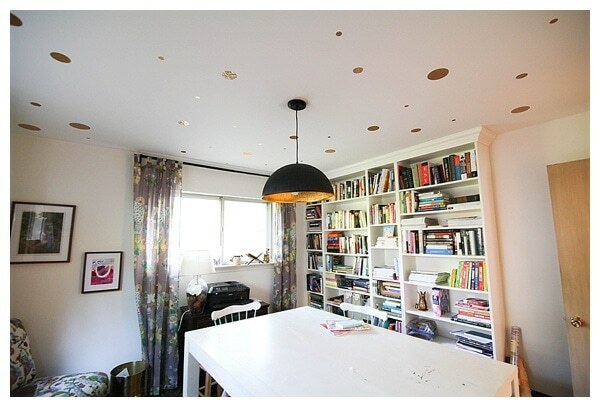 The gold spots on the ceiling of your craft room are especially amazing. I don’t know what I love the most – all of it! You have such amazing style, love it! I will be posting pics of my house soon and if you want to send some advice my way I would love it, haha! 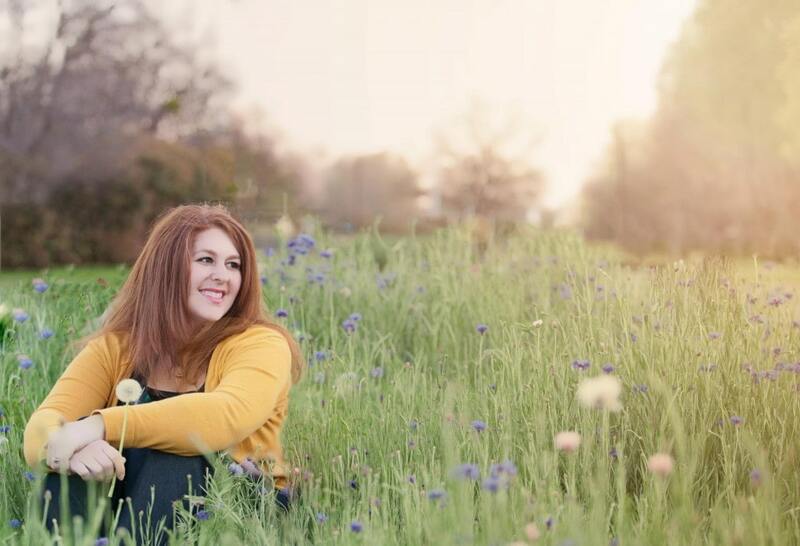 your kitchen is gorgeous, i love the fancy pantry and the room with the bookshelves – swoon! You’ve done such good things! 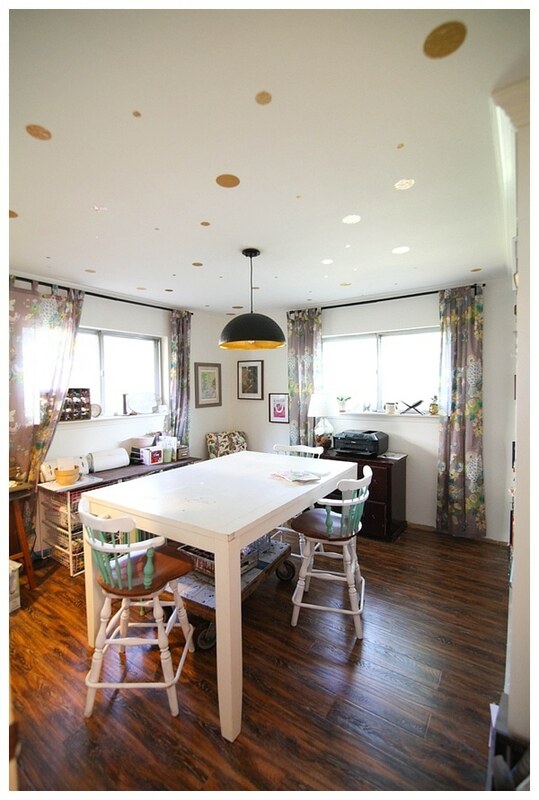 My favorite is the spare room that you transformed into a craft room / library. Brilliant. Wow! You’ve done so much ~ and what an incredible change. 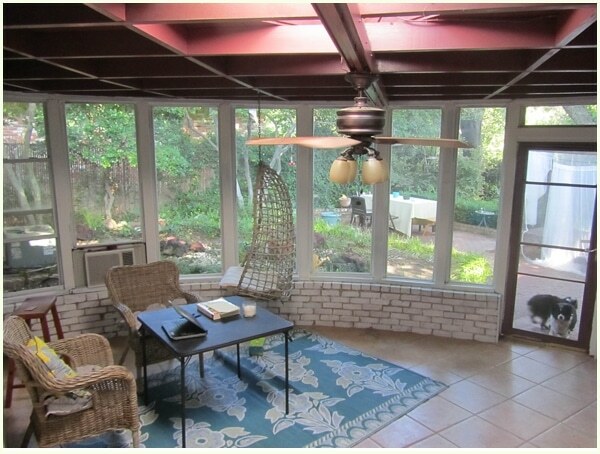 So many aspects that I love ~ the sun room is wonderful, as is the craft room. Love those bookcases! Is that gold vinyl for the dots on the ceiling? 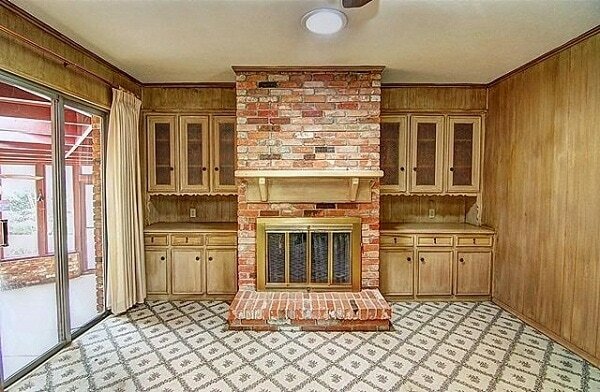 The kitchen…fireplace….all of it is impeccable. Now ~ come over and help me!